The arduCHIP is a small compact board and breadboard-friendly based on the ATmega328. It has more or less the same functionality of the Arduino, but in a very small and compact package (20.6mm x 25.8mm - 0.8" x 1"). It requires a 4.5-5.5V regulated power source and its the perfect companion for the arduSTAMP. The serial interface is fully compatible with the USB breakout board of the arduSTAMP or with sparkFun's FTDI basic. The arduCHIP is a very compact board that will allow you to have the full power of an Arduino on a small footprint. The arduCHIP is meant for users that are familiar with the Arduino environment and are looking for a cost effective bare bones board to use on a constraint space project. 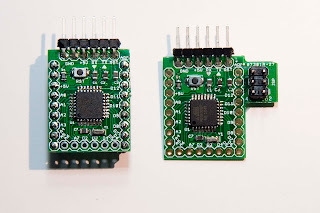 If you are not familiar with the Arduino environment we recommend that you first buy the arduSTAMP or an Arduino Duemilanove or One (they are great boards and a very good starting point). The board is fully compatible with the Arduino software development environment.